build slot 19/04 and still get on the water this season. The ongoing success of Seaward means that the factory is busy building new boats and build slots are at a premium. Call us now to secure your place and be on the water in your new boat by the end of the summer. You’ll Be Glad You’re in a Seaward…. The Seaward Brokerage has two new listings one at each end of the Seaward range. ‘Blue Tiek’ is lying in Corfu and is a much loved and well cared for Talisman 49, spacious and sea-kindly she really is a go anywhere vessel. ‘Aslan’ is a beautiful ‘little ship’ having benefitted from a high specification re-furbishment she is ready for her new owners. Go to the Seaward Brokerage page to view them or call us on 01983 280333 to arrange a viewing. After a pretty cold winter so far, this change in the weather feels like Spring is here and our thoughts turn to getting out on the water once again. Whether dreaming of warm smooth trips to the West Country, Popping across the North Sea to Holland or Cruising up the West Coast of Scotland; now might be a good time to think about passage planning. Angus, the Seaward skipper and instructor, wrote an article a few years ago with tips for planning those longer passages. Have a great start to the season. We start a busy 2019 with a range of boats in production and the biggest order book in recent history! Everyone is excited to see the first of three new Seaward 27 boats due for Spring delivery so please keep tabs on the website and watch the boating press! We are sure to make a Splash! The original principals, Chris Clayton and Mike Burnham, are joined by new investor Mark Huntley, himself a proud Seaward owner, to accelerate plans for the future of the company. New models and market development are well under way and you will hear more about this soon. David Thomas joins as Production Manager! David started in January to fill an essential role within the company. He is young and very enthusiastic but has already gained a wealth of knowledge within the industry and we wish him every success in growing with the business. Brokerage continues to be buoyant! Angus & Sadie, in the brokerage, had the best year in recent times, proving that Seawards are becoming ever more popular; so if you are thinking of a change please contact them quick! The time is now for the coming season. Stephen Thomas steps down as MD. After many successful years with the company Stephen is taking a bit of a break to pursue some sailing interests in the ARC and a change in career. We thank him for all he has done for and achieved with the company and all wish him well for the future. What is a Nelson Hull and why does it work so well? Everyone at Seaward would like to wish you a happy New Year and hope that 2019 brings you all you wish for. The new season is just around the corner and thoughts turn to getting out on the water again in 2019. Thinking of upgrading or downsizing your boat, talk to us at the Seaward Brokerage. Perhaps 2019 is the year to order your new Seaward, please feel free to chat with us about the latest innovations in the Seaward range. We look forward to seeing you during the year. Long though the summer lasted, it appears that winter is definitely here. While winter boating has it’s charms, our boats get used that bit less at this time of year and the temperature and the damp can be detrimental. There are lots of things that we can do to help our little ships during this inclement period. Click the link below to take a look at our ‘Winter Survival Guide’ for Seawards. At Seaward we not only build boats, but have a brokerage department offering a selection of previously owned Seaward Nelson yachts for sale. Our brokers are all ABYA qualified and provide a complete personal service from start to finish. We are ready to help and advise whether you want to buy or sell a Seaward. We can also help with spares, repairs, servicing, valeting, and our Seaward Sea School instructors are available for sea trials and to collect and deliver your boat if required. Our RYA instructors also offer a range of powerboat courses right up to advanced level aboard your own boat if preferred to give you and your family the confidence to make the most of your time afloat. We presently have available the Seaward 23 Corsair on brokerage. She is only on the market because the present owner is retiring from boating, and makes the perfect weekend coastal runabout for two or a young family. Built in 1987, Corsair is constructed of GRP with teak joinery, and fitted with twin 50hp BMW engines with 898 hours on the clock. Hummingbird fish finder, Garmin 128 GPS, a two-year-old VHF radio transceiver, galley cooker with a grill and two burners, hot and cold water, and more. All this for just £19,950. Corsair will make a great winter project. Another Seaward 25 is Nau II which is a very smart twin-screw motor cruiser built in 2004. Her twin 3-cylinder Yanmar 100 hp engines have 440 hours and were removed recently for a deep engine service when the trim tab system was also replaced. The hull wood trim has been stripped and revarnished and her bottom has been freshly anti-fouled. Nau II has Hurth hydraulic gearboxes driving twin 4-blade contra-rotating propellers, together with twin cast bronze rudders fitted. There is a long list of extras and she is offered at £61,000 including VAT. The latest order for a Seaward 25 is from a discerning motor boater from Scotland called Eddie. Having found motor boats a little unsettling in the past, Eddie didn’t just roll over, but was careful to sea trial the Seaward 25 in Ruff conditions near the Hound buoy. On the trip Eddie checked the all round visibility and the vital ‘nose out of the window’ access as well as the overall comfort of the boat. The impact of The Yachtmarket Southampton Boat Show is felt before it has even opened it’s gates. Tough and rugged, Seaward’s Nelson designed motor boats have an enviable reputation both in the commercial world and as safe go-anywhere leisure boats. Their semi-displacement design means fast comfortable cruising even in the worst conditions. Seaward 35 owner, Richard Harrison, likes to aim high and challenge himself in all things, his boating is no exception. After lots of self study and some training sessions in his home port of Plymouth, Richard came to The Seaward Sea School in Cowes, with his Seaward 35 ‘Bruiser’ to attend a preparation course for his RYA Yachtmaster Offshore. A few, challenging, long days with instructor Angus Belcher, including two complex night exercises in one of the UK’s busiest waterways, and Richard was ready for his exam. and was set day and night navigation exercises. After tying up, late at night, in Southampton Richard was rewarded with a pass. the latest additions and developments to these boats. Details of all of the latest Seaward models will be available and Seaward staff will be on-hand to give advice and discuss your needs. The Seaward Nelson pilot boat range is one of the best known pilot boat series in the world. For example, over 300 of the Nelson 40 pilot boat have been produced and are in service day in, day out around the world. all day and every day. They have an exceptionally soft ride and are easy to handle in rough sea conditions and when boarding ship. The story of Nelson pilot boats goes back to 1864 when Sir John Thornycroft built a steam launch on the River Thames. Two years later, in 1866, his father bought some land next to Chiswick Church and this was the beginning of the shipyard of John I. Thornycroft and Company. Ten years after that, Thornycroft built the first torpedo boat for the British Navy, HMS Lightning. The company remained in the Thornycroft family until 1965 when it became part of Vosper, Thornycroft Group. In 1955, grandson Peter Thornycroft founded Keith, Nelson & Company Ltd, and in 1965 T.T. Boat Designs Ltd. He built the first real Nelson in 1959 for Baron de Rothschild who wanted to get to The Royal Yacht Squadron at Cowes quickly from his home on the River Beaulieu. This was a 29’ boat and was quickly followed by the Nelson 32 and the Nelson 34. The Royal Navy bought many of the latter boats including two for the Royal Yacht Britannia as VIP launches. The 34 was followed by the 40’ Edelweiss in 1964 which was capable of 20 knots, and in 1967 a Dutch customer ordered a 40’ with twin engines capable of 25 knots. The Thornycroft hull design has hollow buttocks which provide a very flat run giving lift for full planing speeds, and it also gives a soft ride at semi-planing speeds which makes it considerably more comfortable. Thornycroft designed slack bilges forward with a deep entry and bilges that turn tightly towards the stern for a comfortable ride in head seas. The 40’ Nelson enabled pilots to be ferried from shore to ship in any sort of weather meaning that it was no longer necessary to have expensive cutters on cruising station. If you are looking for a Seaward Nelson pilot boat for sale, Seaward produces the Nelson 35, Nelson 40, and Nelson 42, the latter being able to seat up to eight people. We also make the Nelson 29 which is available in pilot boat design or as a service/patrol boat. A modern pilot boat has to be built to be fast and tough, bumping against the side of a 100,000 ton tanker ship as often happens. Equally importantly, it has to be able to operate in all types of weather as the pilot has to get to the incoming ship no matter what. The job of a pilot actually goes back to the days of Ancient Greece when ships’ captains would use local harbour captains – often local fishermen with a sound knowledge of the area – to bring their vessel safely to shore. Eventually, local harbours each licenced pilots for their particular area. The Boat Development Co. – Builders of Seaward Boats. ***Dateline January 2018: Seaward Boats announce new model – the Seaward 27 E18 motor cruiser, the latest in a line of Nelson type all-weather leisure boats built to commercial standards where seaworthiness, comfort and reliability are paramount. Developed from the Seaward 25, this new addition to the range has a longer main cabin and bathing/boarding platform incorporated into the hull, and is available with 3 layout options. The all-new Seaward Nelson 27 E18 motor cruiser with aft cockpit. Dateline Feb 12, 2018. Cowes: Tooling is now in production for the first all-weather Seaward 27 E18 motor cruiser. Her pedigree has evolved from the well-proven Seaward 25 and she boasts a larger wheelhouse and longer hull with in-built transom platform. As always at Seaward, the new owner is involved at every stage of planning their new boat. With a top speed of 22 knots and a great cruising speed of 18, coupled with the excellent sea-keeping that she shares with the rest of the Seaward range, this capable and sturdy little vessel is equally at home coastal cruising or hopping across the Channel for dinner, even when the weather turns. The Seaward 27 is remarkably manoeuverable; close quarters boat handling is made easy by her twin shaft drive engines, deep keel and unique hull design. Visibility is really good all round and the ergonomic sit/stand helm position with it’s adjustable wheel, footrest and seat make handling the boat in a busy marina a pleasure. Installation of the reliable and tough twin Yanmar 110hp common rail diesel engines with independent fuel and electrical systems, provides reliability and peace of mind for those longer offshore passages. Life aboard the new 27 will be a pleasure. Careful design and planning has led to the layout options you can see on the right, click on any one to see the full sized drawing. The wheelhouse is long enough to accommodate a pilot berth without compromising the ability to have a proper navigators seat and chart/storage locker. The galley, fitted with the option of a neat ceramic diesel-fired hob or two burner gas hob, a stainless steel sink and 240v microwave cooker as standard, can be fitted in the wheelhouse or below in the well thought out forward cabin. The forward cabin has two V berths, a table that also acts as an infill to convert the berth into a large double. There is a fully enclosed heads to port. The self-draining cockpit gives another dimension to the Seaward 27. The optional all-over canopy creates a comfortable living space with luxurious cushions available for the cockpit seats (under which there is easy access to the engines). A neat transom gate leads to the aft platform. Seaward Boats are a unique and remarkable breed of ‘go-anywhere’ craft. 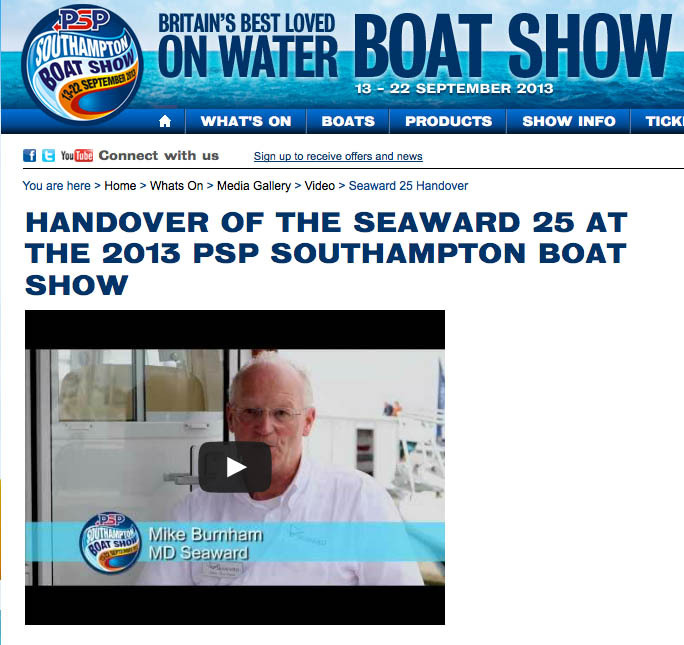 The new Seaward 27 is no exception. Anyone wanting a traditionally built, go-anywhere motor cruiser tailored to suit their exact requirements, should contact The Boat Development Co Ltd for further information. General arrangement with option for a fixed seat behind the helm position and bench seating on the starboard side. Standard ‘no-gas’ galley arrangement with diesel-fired hob and microwave fitted as standard. There is an option to have the galley in the wheelhouse. Forward cabin: showing galley and double bed/dinette arrangement. The enclosed heads are located opposite the galley. LOCAL SUCCESS STORY: The latest Seaward 39 motor yacht, undergoing trials in the Solent. These Seaward all-weather powerboats and commercial craft are designed and built on the Isle of Wight and exported all over the world. Dateline 15th September 2017 – Southampton Boat Show. Paralympic Gold Medallist Helena Lucas MBE highlighted a local success story at the Southampton Boat Show today when she presented the all-new Seaward 39 motor cruiser to press and public. These Seaward Nelson-type boats, which have a reputation for being the best all-weather boats in the world, are designed and built by a committed team on the Isle of Wight, and Helena’s husband Stephen Thomas happens to be the Managing Director. The Boat Development Co Ltd, builders of the Seaward range, has been in Cowes for almost 5 years now, and as a specialist British manufacturer has brought much needed employment to the area. Employing 20 staff at its yard in Prospect Road, Cowes, the Company produces a range of specialised commercial and pleasure boats under the Seaward brand. These are shipped worldwide to discerning users who want to have the ultimate sea boat built in a rugged and refined way. Recent deliveries have been to The Channel Islands, Italy and Spain where the unique sea-keeping and quality build of these boats are well recognised. These Seaward boats range from 19 to 46ft, and commercial versions are used by Harbour authorities and pilots across the world. 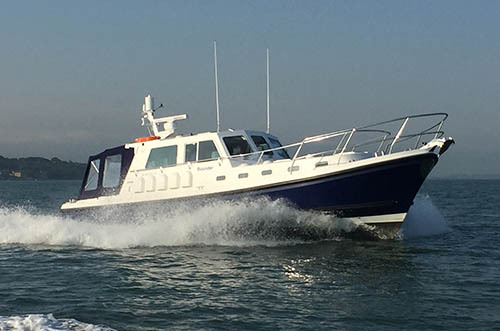 This new Seaward 39 is the first in its class of private motor cruisers, and highlights the quality of workmanship available on the Isle of Wight. “This new Seaward 39 is the latest product in a massive development programme to heighten quality, comfort and ride right across the range.” Says Mike Burnham, Director of the firm. “Among the innovations to reduce noise and vibration are special isolation for the engines, extensive noise absorbent materials incorporated in the layup of the hull and deck, and a wheelhouse that ‘floats’ on an isolation membrane separating it from the hull and machinery. “We have also made considerable improvements to the interior furnishings by bringing these craftsmanship skills in-house. All electrical installations are now carried out by the in-house team as well. In reality, our boats are now built like small superyachts.” Burnham adds. The layout accommodates four in the owner’s suite and mid-section guest cabin. She also has a large well-equipped galley amidships and spacious wheelhouse that doubles as a day saloon and dining room offering panoramic views. 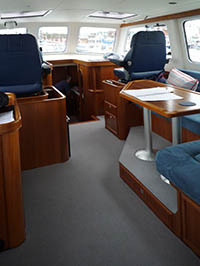 The aft cockpit, which is easily accessed from the wheelhouse and side decks, also has a large table for al-fresco dining, together with a stern platform, which is moulded into the hull to provide a safe and stable boarding point from a dinghy and for swimming from. Paralympic Gold Medalist Presents the new Seaward 39 from the Isle of Wight. Our new Seaward 42 model has been highly commended at the Motor Boat Awards 2017 in the Wheelhouse and Cockpit Cruiser category. 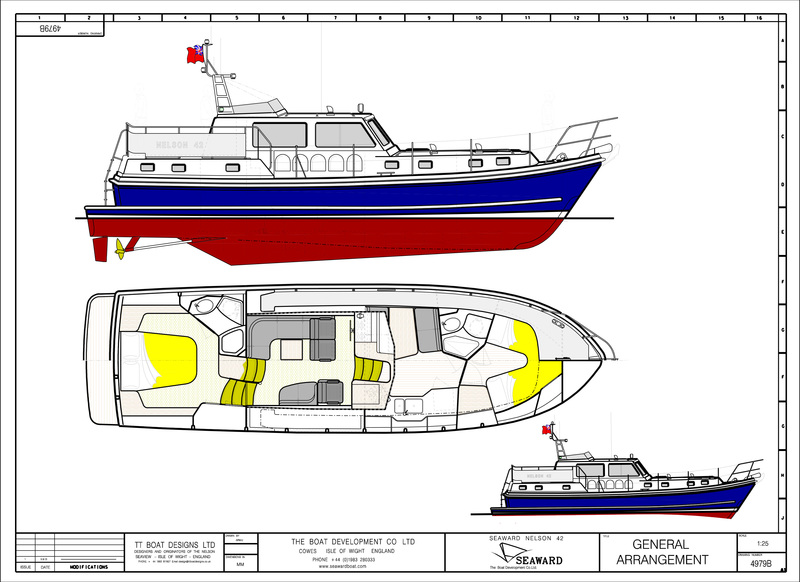 Profile and general arrangement plan for Seaward’s new flagship Nelson 42 E16 with aft cockpit. The all-new Seaward Nelson 42 E16 motor yacht with aft cockpit. The Boat Development Co Ltd, builders of Seaward boats, is launching its new flagship model, the all-weather Nelson 42 motor yacht on Marina berth M122 at the Southampton Boat Show. Based on the same hull used to build pilot boats and service launches, she shares many of the commercial components that make these boats so admired by their professional operators. Bounder, the first of these new Seaward 42 Motor Yachts, is an aft-cockpit version ordered by an experienced owner, whose previous boats have included a Seaward 35 and large sailing yachts. He plans extensive short-handed cruising and has opted for a single cabin arrangement with a large wheelhouse incorporating a well-appointed day area, a central dinette and galley, and master stateroom forward to maximise on living space. An aft cabin version of the Seaward 42 is also available, featuring a master ensuite cabin below a raised aft deck with a second external helm position. Bounder is powered by twin Cummins QSB 6.7 litre engines, developing 425hp each, giving her a 26 knot top-speed. Her impressive specification includes both a Gyro-stabiliser and Humphree Interceptor active trim control systems to minimise motion and enhance even further the capabilities of this remarkable all-weather vessel. Anyone wanting a traditionally built, go-anywhere motor yacht, tailored to suit their exact requirements should contact The Boat Development Co Ltd.
Seaward delivers Gemini, Lybra’s twin, the second of two new Nelson 40 pilot boats for Genoa. The second of two new Seaward Nelson 40s, built for Genoa Pilots, has been handed over to her owners today. The Seaward 23 and the Channel Island 22 are both small but well designed boats that have stood the test of time, but which one makes more sense for a second-hand buy? Please find enclosed a link that will enable you to download the latest Seaward Squadron Newsletter. This gives details of the Rally that was held in Dartmouth, earlier in the year and information about next years rally for your diary. When the sun is out, gardening guru Alan Titchmarsh likes to turn his attention from laburnums to his love of boating. Between writing numerous gardening books and novels, presenting the Chelsea Flower Show programmes and hosting his own chat show, Alan is often out in the Solent on his beloved Seaward 25. The Seaward Squadron is the association for owners of Seaward Boats. Formed in 1987 by Mike Wood, who purchased the first Seaward 23, ‘Zenith’, which appeared at the Southampton International Boat Show in 1985.The first gathering was held in Guernsey in 1988 where 8 boats attended. Angus Belcher, Principal of the Seasmart Motorboat Sea School based at Cowes, signed a deal at Seawork 2013 today to join forces with The Boat Development Co Ltd to form the Seaward Sea School. 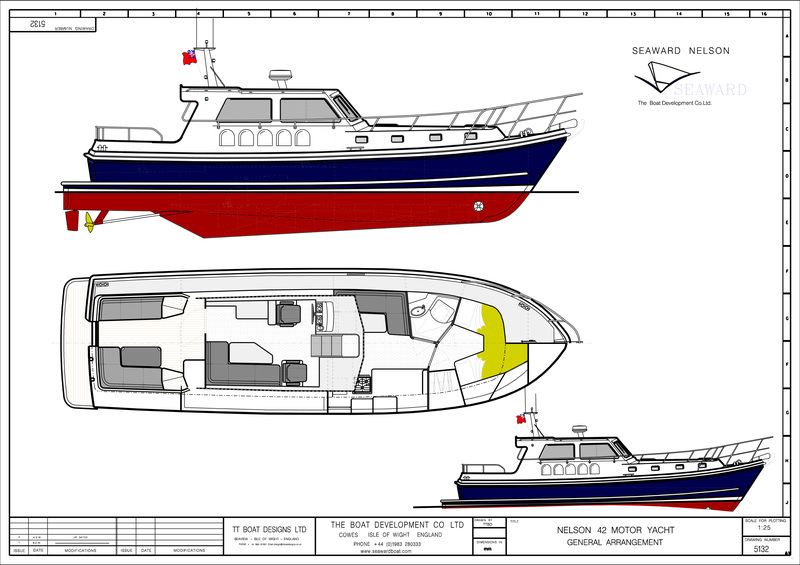 The new company has ordered a purpose designed Seaward 29 motor cruiser, drawn like other rugged Nelson type leisure and workboats within the Seaward range, by TT Design. Seaward to demonstrate a new version of their Seaward 19 workboat at the Seawork 2013 International Exhibition, Southampton – 25th-27th June. Seaward, builders of the famous Nelson all-weather pilot, harbour and work boats will be showing plans for a new 8-seat Nelson 42 Pilot Boat configuration alongside their extensive range at this month’s Sea Work 2013 International show at the ABP Port in Southampton.